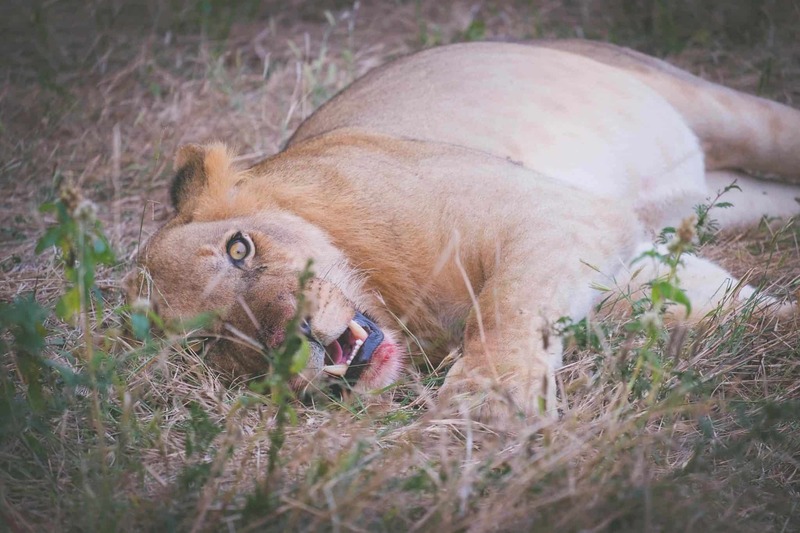 We went to Nairobi National Park for one reason – a photo. The photo is a familiar scene in Africa. A lion laying in the grass making eyes at the photographer. The backdrop to this photo is one of the largest cities in Africa. The moment we saw it we knew we had to go to Nairobi National Park. I won’t lie and say it’s the most beautiful park or the best place to go on safari. 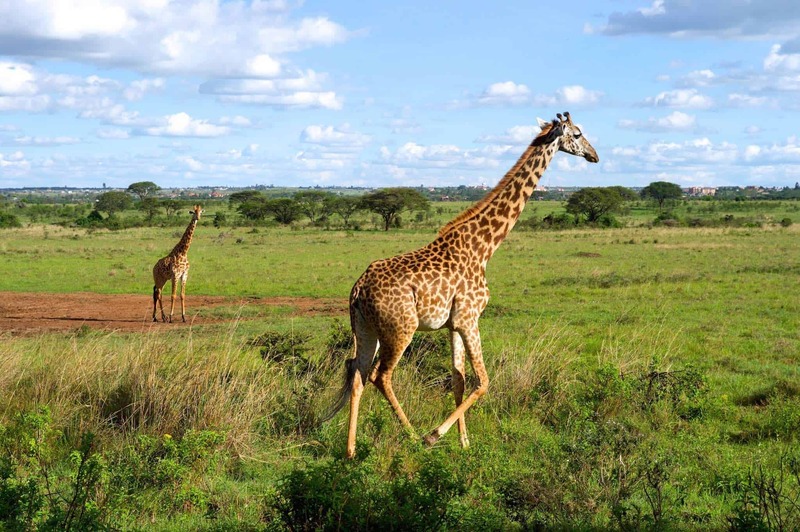 However, Nairobi National Park is the only major National park located in a city center. It’s amazing that within one hour you can go from a hip coffee shop to photographing African Buffalo, a feared member of the “Big Five” animals. In some ways, Nairobi National Park is a microcosm of Africa. 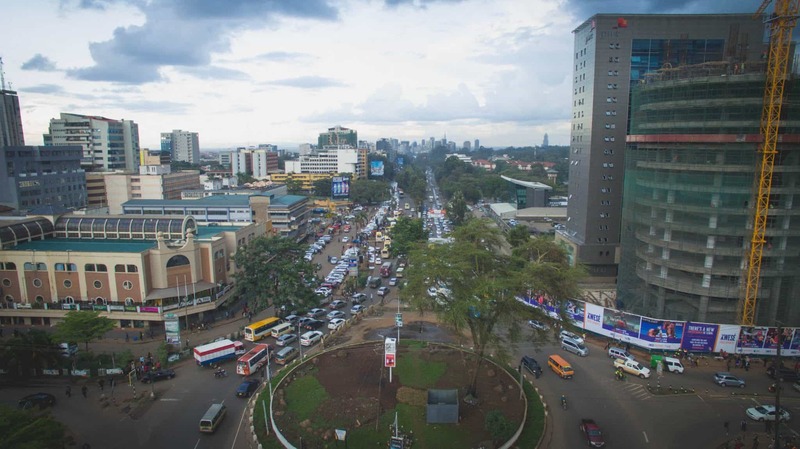 Nairobi is hurtling towards the modern world while the population continues to explode, the wealth divide deepens, land degradation is at an all time high, and surrounded by the chaos is the African wildlife. When doing research about our first trip to Kenya and Nairobi we came across Ololo Lodge in the Nairobi National Park. In search of the perfect escape from Nairobi we knew that hiding away in a skyscraper hotel is okay for a day or two, but we were in search of something that would connect us to the roots of Nairobi. After all, Nairobi and Safari used to go hand and hand, but the buzzing metropolis of today makes that seem a distant memory. For us a safari in Nairobi is not your standard destination. It’s not something worth traveling to specifically to Nairobi for. Instead it acts as a wonderful precursor, afterward to a safari in Kenya, or weekend escape from the city center. In fact, the proximity to Nairobi’s Wilson Airport makes it the perfect stopover in between bush flights to the Masai Mara or Amboseli. After spending a few weeks hopping around Kenya we made an end in Nairobi National Park before flying off to our next safari destination. The highlight of our time in the park was enjoying our lodge and spotting black rhino in the park. Situated on the quiet Southern border to the park is Ololo Lodge. 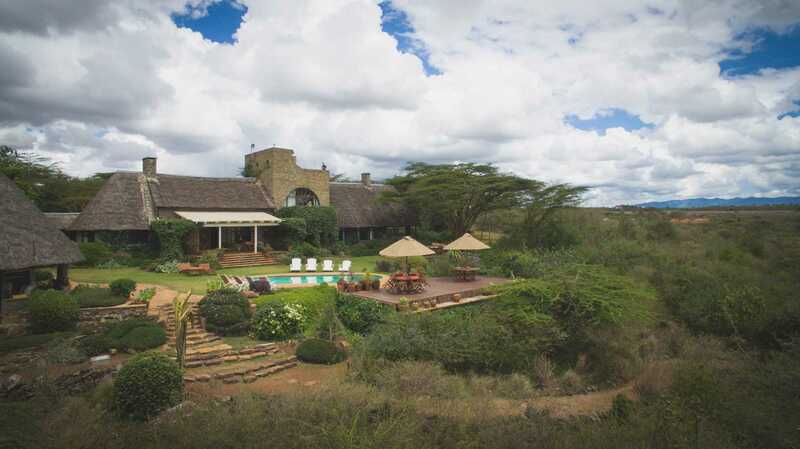 The safari lodge is owned and operated by an Australian farming family. 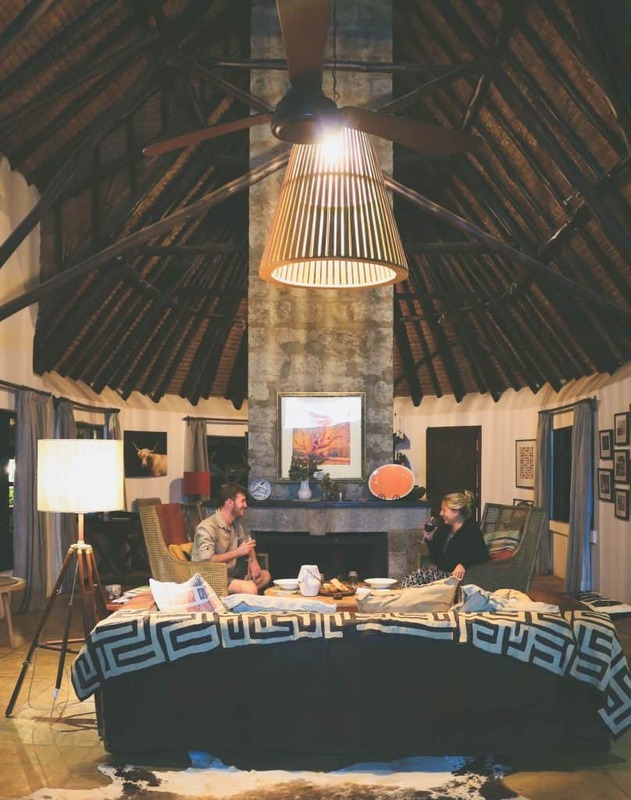 Their roots are evident in the lodge with fresh produce coming from their garden and safari traditions that are not missed. Ololo Lodge has the feel of a bed breakfast with a lovely garden and earthy tones in the interiors that one would not expect to find in Africa. The lodge’s location makes it secluded from the main part of the capital city. Rebuilt from a traditional farmhouse the property is filled with charm and character. Their rooms range from lovely stable rooms, two suites in the main lodge, and individual safari style bandas. We spent our time between game drives relaxing on our deck reading a book or walking around the gardens overlooking the river. 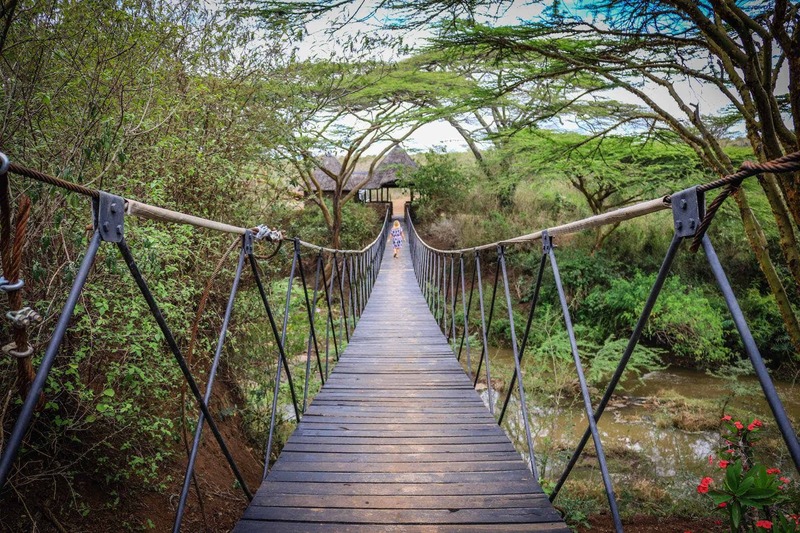 Those eager to explore the park can just take the short walk across a wire bridge directly into Nairobi National Park. Our room was the tower room. It was light, airy, comfortable, and featured two decks. One of which is accessible via a spiral staircase and overlooks the whole park. Mornings in Africa should be prized and we took good care to savor them from the comfort of our private deck as the day broke. After daybreak guests can enjoy breakfast on the grounds while birdlife darts by from the park. A highlight at breakfast were their farm fresh mushrooms, grown on site, and homemade muesli. 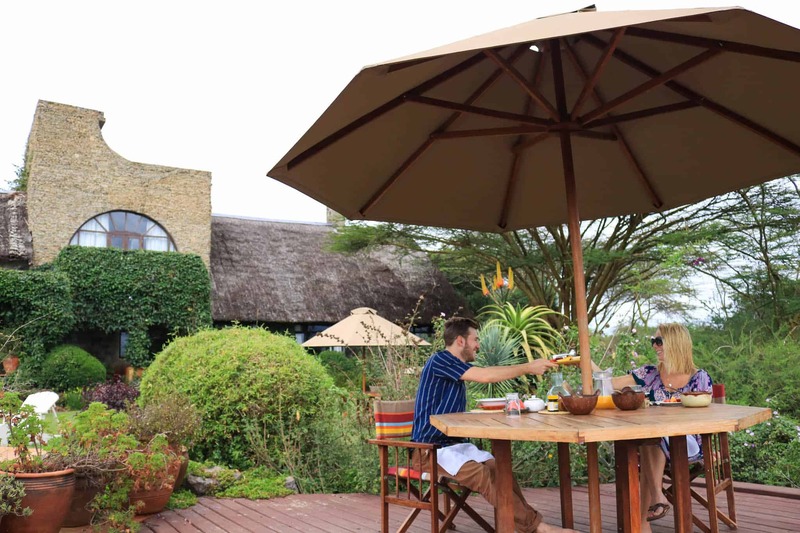 Ololo Lodge can cater to outside guest looking to enjoy their garden restaurant. However, it is based on availability at the lodge so outside guests should call in advance to make reservations. 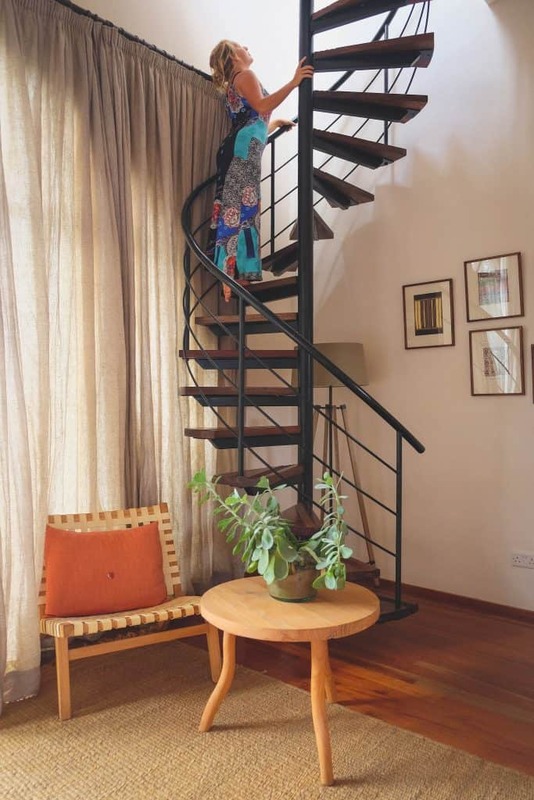 It makes for the perfect Nairobi weekend escape for residents and business travelers. The lodge main lounge is a large airy room with a central fireplace and is the ideal place to relax on chilly evenings around Nairobi. WiFi can be found throughout the property and we had a good signal on our mobile phone so business travelers can rest assured knowing they can stay connected here. See the rates at Ololo Here. We loved the lodges approach to sustainability. Disposable plastic water bottles are commonplace in hotel rooms and even lodges; here rooms receive a fresh supply of water every day in a ceramic pitcher. It’s steps like this that may be small, but can make massive strides towards waste reduction. This is an addition to their large gardens helping supply the restaurant help lessen the lodges environmental impact. Overall, we found Ololo Lodge to be an amazing place to stay when on safari in Kenya. 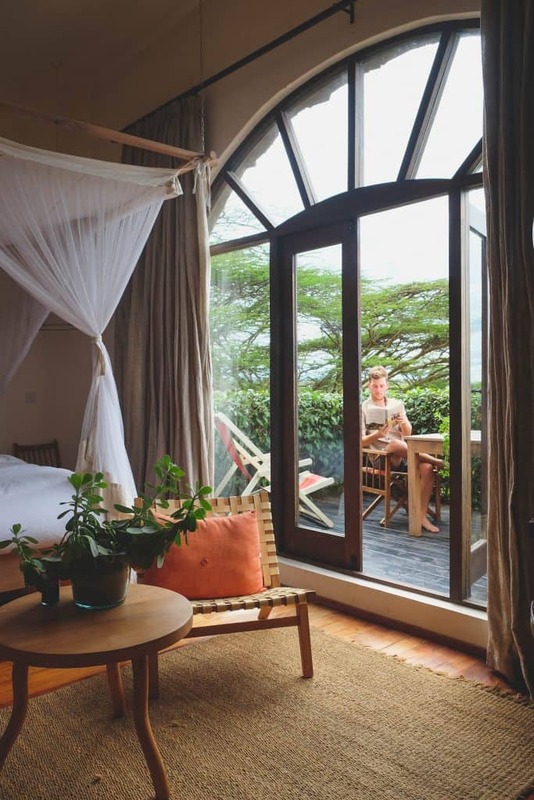 Their proximity to Nairobi Wilson, only a thirty minute driving through the park, make them a clear winner for those looking to escape the west and immerse themselves in wild Africa while still close to the city. Nairobi National Park was the very first park in Kenya. Opened in 1946, the park is the oldest national park in Africa. History in the park expands much past 1946 to the earliest days of Nairobi when settlers from England first arrived and pushed the animals to the South and East of the city. By 1932 the animals had nearly vanished from the plains of the park. Alarmed by the vanishing wildlife Mervyn Cowie began campaigning for the formation of a protected park. Finally, it became official and Mervyn was named the director of the parks service. The park is 28,963 acres large. By most accounts, this is small in comparison to many of Africa’s national parks. The park has a fence on its North, West, and Eastern boundaries. The Southern border is the Mbagathi River. The park is largely dry, but shares a similar climate with Nairobi. Weather here is dry and hot from January to March. April usually is the onset of the rainy season that lasts until June. During the rainy season weather can be similar to spring with cool evenings and mornings and periodic rain showers. From June onwards the rains become less common and the weather cools off. Many refer to this climate as the perpetual spring. Nairobi National Park is likely the best place to find rhino in Africa. 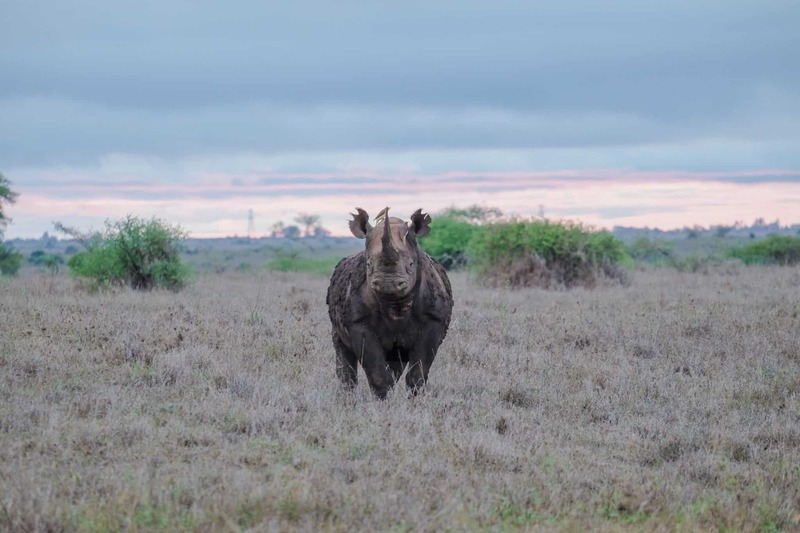 While the Kenyan Wildlife Services will not directly release the Rhino population consensus it is used as a haven for the besieged animal and contains the largest population of them in Kenya. We saw a ton of Black Rhino with just our first day in the park! If you miss the Black Rhino in the larger parks of Kenya it’s worth a Nairobi safari to see this fleeting animal in the wild. Other regulars in the park include lion, giraffe, zebra, wildebeest, and buffalo. 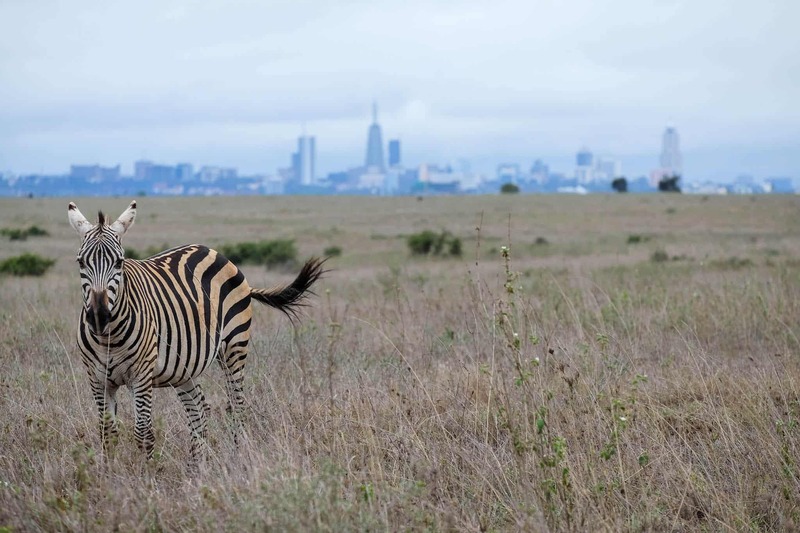 In all, Nairobi National Park has roughly 100 mammals. It’s worth nothing that the park is absent of the African elephant. Birdlife in the park, as in many places throughout Africa is wonderful with nearly 400 endemic and migratory birds that pass through the park’s boundaries. Nairobi National Park is open all year round. While, the national park fees are high for foreigners they are the cheapest out of all the Kenyan National Parks. The park fees between citizen and foreigners are exorbitant at almost 1o times more expensive. There are a number of ways to visit Nairobi National Park. We chose to go with one of the most luxurious and stay at Ololo Lodge, but there are more affordable options. 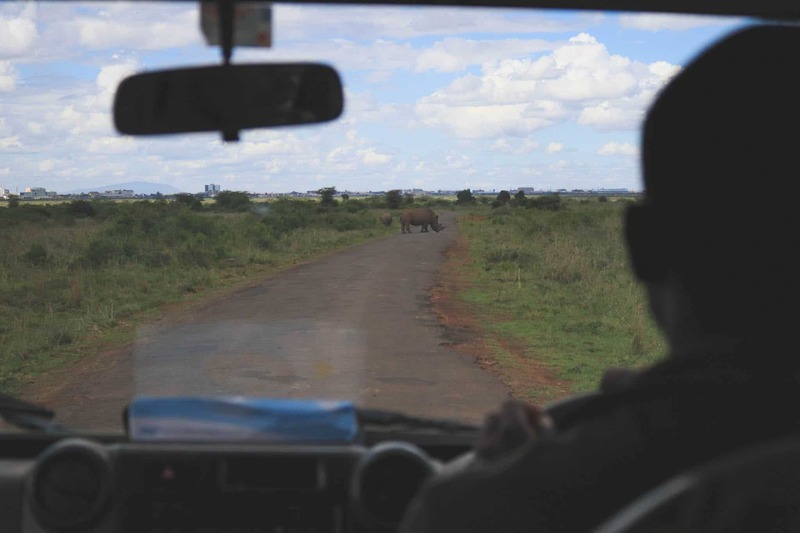 Visitors can hire a local safari operator for a Nairobi National Park tour. This means going on safari with either a private vehicle or in a shared safari vehicle. A private vehicle is more expensive, but due to the prevalence of cheap safari vans (or “vanderbeest,” as the locals say), there are deals to be had. A Nairobi safari with one of these vans goes for roughly $110 USD for the vehicle, driver, and fees. That price does not include individual guest park entrance fees. If you choose to go with one of the more traditional safari operators offering tours in a game viewer in the park expect to pay about $60 USD per person for a half day safari. This does not include the park entrance fees. You can book your tour in the park here and they’ll pick you up from your hotel! There is also the ability to take a shuttle bus offered by KWS on Sundays at 2:00 p.m. The park services drive guest around in a big bus for a 2 1/2 hour tour. It’s worth noting that weekends in the park can get very busy with locals in vans and their personal vehicles so we recommend paying a little more as a foreigner since park fees are already high. Check Out Other Kenya Safari Tours!